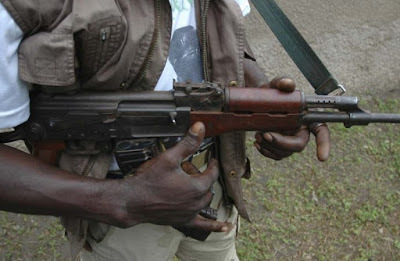 Two armed men who have been terrorising Onitsha and its environs, on Monday killed two policemen and escaped with one AK47 rifle. An eyewitness said the armed men, who rode on motorcycle, took the policemen unaware and shot them at lose range near Tracas junction, Upper Iweka axis of Awada near Onitsha. The source, who pleaded anonymity, said one of the policemen, an inspector, was rushed to Nnamdi Azikiwe University Teaching Hospital (NAUTH), Nnewi, but later died. According to the source, the other police officer, a sergeant, died on the spot. The deceased officers were on patrol when they met their untimely death. The incident forced people around the area to close their shops. Contacted, the Police Area Commander, Onitsha, Mr Yahaya Abubakar, who confirmed the incident, said he could not speak on the matter because it occurred at Awada, an area outside his command. Efforts to get further details of the incident from Mrs Nkeiru Nwode, the state Police Public Relations Officer, were not successful. The attack is the fourth of such attack in Onitsha and its environs on police officers since January.